Cut the chicken into pieces, leaving the skin on. Heat the olive oil, garlic cloves and red hot chili peppers (powder or whole) in a large, high sided casserole, making a 'soffritto'. Once the oil starts to sizzle, add the chicken bits - skin side down. In the meantime clean the peppers, wash and cut them into small pieces. As soon as the chicken gets a nice brown colour, add a glass of white wine and let it reduce over a high heat. Once the wine has evaporated, lower the heat and add the peppers. Season with salt to taste. Cover the casserole and allow to cook for about an hour, checking every now and then that nothing is getting burnt. Add a little water if necessary. As soon as the chicken is cooked, flavour with some shredded basil leaves and serve. You can tweak this recipe according to your own personal taste, by adding vegetables, or you can turn it vegan: just replace the chicken with some seitan or tofu (and adjust cooking time accordingly!). Serve as a main course together with some cereals such as Riso Gallo's 3 Grains (rice, spelt and barley) or with steamed potatoes. Merlot, Riesi DOC or Chardonnay Sicilia DOC. 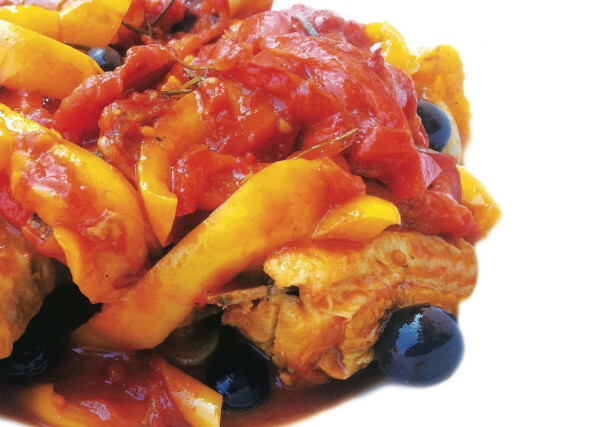 This amazing stew, whose main ingredients are chicken, peppers and tomatoes, is a speciality of the Italian region Umbria. With its delicate, yet savoury taste, it makes the ideal dish to serve at a family get-together on Sunday or on a special occasion. Serve it with the right glass of wine and you'll win over your guests!